← A trip to the bog and a bundt…..
It’s a thoroughly miserable evening here in Clara. The rain is lashing against the front windows and it’s starting to get dark but my house is warm, cosy and full of laughter. It’s sometimes nice to take a moment and just look around. Don’t get me wrong my children are world champions in fighting with each other but on a day such as this they are best pals and I love to see them have fun together. 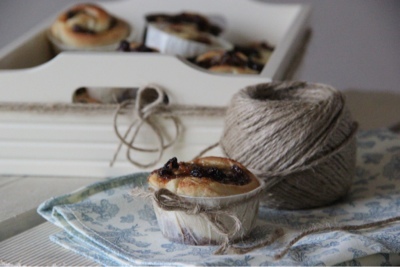 My jars of mincemeat are not really meant to be opened for another week but I couldn’t resist making these little swirly buns as a treat for after dinner. To make sure they are delicious I have sampled a few, honestly no need to thank me……. Preheat oven to 220 degrees. Melt the butter over a low heat before adding the milk. When this is lukewarm remove from the heat and add the yeast, sugar and salt. Slowly add the flour until the mixture forms a dough, turn onto floured surface and knead for 3 minutes. Leave to rise in a greased bowl, covered, for 45 minutes. When dough has risen roll out into a rectangular shape. Spread the mincemeatover the entire rectangle. From the long side roll the dough to form a swiss roll shape before slicing into 16 pieces. Bake in oven for 10 minutes or until they are golden on top. Leave to cool on wire racks. So there is my recipe to help brighten up a dark and dreary evening. More Christmas recipes to follow in the next couple of weeks! Hi Paula, These look brilliant – especially with the string round them. I was wondering though, what is “cream flour”? Hi there, it’s just plain flour! I am in the habit of calling it cream flour as that’s what odlums package it as here! Thanks for comment! Just looked at your blog, your pictures from Italy are fab! 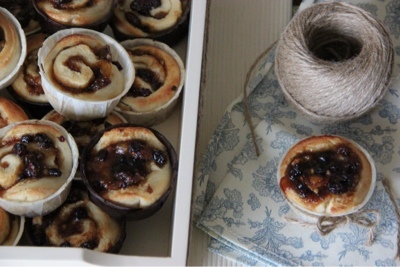 I love the new look of the blog!Please don’t hate me but but I really do not like mincemeat. I eat pretty much everything dead or alive( I am french remember!!) but for some strange reason I just don’t like it. Having said that it might grow in me like Christmas cake did! Peggy you just made me laugh out loud! I never liked it as a child and now I can’t get enough of it! You should try making it yourself, completely different from the jarred stuff!